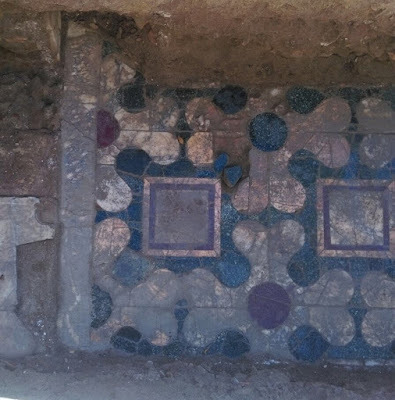 Roman cut stone or "opus sectile" floor, in a newly discovered villa near the Milvian Bridge in Rome. Well, it's symetrical, but it isn't going to get many points from me for looks. Do you think aesthetics have changed much in 2000 years? I actually thought it was quite a nice design, but then I'm imagining it clean and intact, as well as what sort of room it might have been used in. It's also worth noting that modern sensibilities are somewhat different because of technological progress making previously impressive objects seem mundane and ordinary. Modern glass, for example, doesn't really impress us these days, but to the ancient Romans it would have seemed miraculous that we can produce such complex and high quality glass objects like soda bottles or porcelain toilets on a mass scale. In the same vein, this floor might seem banal by modern flooring standards, but to the Romans this was surely impressive and showy, requiring skilled craftsmanship and using expensive materials. I'm still impressed by glass. -- Continuously transforms from the solid state to the viscous plastic state. -- You can walk out over the Grand Canyon (South Side) and look straight down. The floor is glass. Talk about vertigo. -- Resistant to most acids. -- You can create rainbow glass by changing the density across the glass. We don't think about glass much because it's everywhere, but it has a great wonder about it.